(15/P54) TRENTON – The Christie Administration today filed a complaint in U.S. District Court arguing that a federally funded research project using strong seismic blasts to map ocean sediment deposits should be stopped because it will adversely impact economically vital commercial and recreational fisheries and harm marine mammals. The complaint filed by the Attorney General’s Office this morning in U.S. District Court in Trenton argues the project violates federal laws protecting marine animals and requests the National Science Foundation (NSF) to perform an area-specific environmental impact study before proceeding any further. Rutgers University, the NSF’s contractor, launched the project this week, despite objections from Governor Christie, state and federal lawmakers, and advocacy groups. “We are not going to give up this fight,” Department of Environmental Protection (DEP) Commissioner Bob Martin said. “It is extremely disappointing that the federal government is moving ahead with this misguided project despite widespread objection from all quarters and without regard to the negative impacts on New Jersey. Commercial and recreational fishing support about $1 billion in revenues in New Jersey. The testing is being done in federal waters in a 230-square-mile area southeast of Long Beach Island, an area well-established for fishing. Among the many species of fish that are available off the Jersey coast in the summer are bluefish, black sea bass, summer flounder, black drum, herring and mackerel. Those who have publicly expressed strong opposition to the project include U.S. Senator Cory Booker, U.S., Representative Frank Pallone, State Senate President Stephen M. Sweeney, Clean Ocean Action, the Marine Mammal Stranding Center, the Recreational Fishing Alliance, the Jersey Coast Anglers Association and the New Jersey Outdoor Alliance. Bob Schoelkopf, Executive Director of the Marine Mammal Stranding Center in Brigantine, said the testing could result in deaths of dolphins and whales by disrupting feeding patterns. The waters off New Jersey provide prime birthing areas for bottlenose dolphins over the summer, Schoelkopf said. Humpback whales are also migrating from birthing areas off the Dominican Republic to North Atlantic waters. The DEP provided the NSF with peer-reviewed studies that show that underwater seismic blasts cause fish to move out of areas where this type of testing is done, causing shifts in distribution and declines in numbers of fish that can be caught, and may even cause immediate mortality. Rutgers is conducting seismic ocean blasting tests to examine changes in layers of deep-sea sediments. 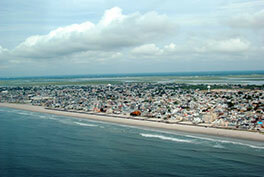 The project is taking place in waters 18 to 45 miles southeast of Barnegat Inlet. The process involves repeated underwater blasts of compressed air that can generate up to 250 decibels. In comparison, a jet engine generates about 160 decibels. The U.S. District Court and the U.S. Court of Appeals last year ruled against the State in its efforts seeking an injunction to block the work, which was initially scheduled to take place last summer. The project did not move forward at that time due to mechanical problems with the research vessel.